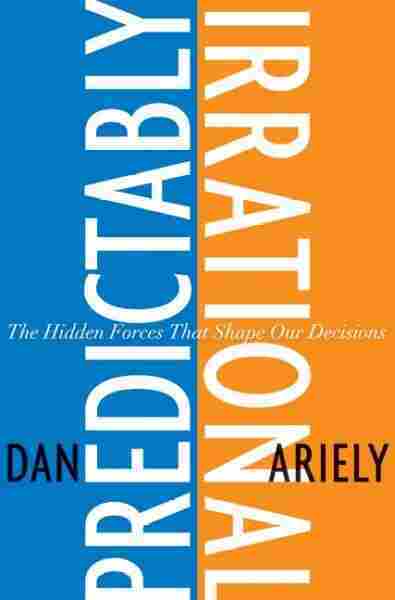 Predictably Irrational NPR coverage of Predictably Irrational: The Hidden Forces That Shape Our Decisions by Dan Ariely. News, author interviews, critics' picks and more. An upbeat cultural evaluation of the sources of illogical decisions explores the reasons why irrational thought often overcomes level-headed practices, offering insight into the structural patterns that cause people to make the same mistakes repeatedly. 150,000 first printing. February 21, 2008  Behavioral economist Dan Ariely studies the way people make economic decisions. In his book, Predictably Irrational, he explains how the reasoning behind these decisions is often flawed due to invisible forces at work in people's brains. One day while browsing the World Wide Web (obviously for work—not just wasting time), I stumbled on the following ad, on the Web site of a magazine, the Economist. I read these offers one at a time. The first offer—the Internet subscription for $59—seemed reasonable. The second option—the $125 print subscription—seemed a bit expensive, but still reasonable. But then I read the third option: a print and Internet subscription for $125. I read it twice before my eye ran back to the previous options. Who would want to buy the print option alone, I wondered, when both the Internet and the print subscriptions were offered for the same price? Now, the print-only option may have been a typographical error, but I suspect that the clever people at the Economist's London offices (and they are clever—and quite mischievous in a British sort of way) were actually manipulating me. I am pretty certain that they wanted me to skip the Internet-only option (which they assumed would be my choice, since I was reading the advertisement on the Web) and jump to the more expensive option: Internet and print. So what was going on here? Let me start with a fundamental observation: most people don't know what they want unless they see it in context. We don't know what kind of racing bike we want—until we see a champ in the Tour de France ratcheting the gears on a particular model. We don't know what kind of speaker system we like—until we hear a set of speakers that sounds better than the previous one. We don't even know what we want to do with our lives—until we find a relative or a friend who is doing just what we think we should be doing. Everything is relative, and that's the point. Like an airplane pilot landing in the dark, we want runway lights on either side of us, guiding us to the place where we can touch down our wheels. In the case of the Economist, the decision between the Internet-only and print-only options would take a bit of thinking. Thinking is difficult and sometimes unpleasant. So the Economist's marketers offered us a no-brainer: relative to the print-only option, the print-and-Internet option looks clearly superior. Which one would you choose? In this case, Sam knows that customers find it difficult to compute the value of different options. (Who really knows if the Panasonic at $690 is a better deal than the Philips at $1,480?) But Sam also knows that given three choices, most people will take the middle choice (as in landing your plane between the runway lights). So guess which television Sam prices as the middle option? That's right—the one he wants to sell! Of course, Sam is not alone in his cleverness. The New York Times ran a story recently about Gregg Rapp, a restaurant consultant, who gets paid to work out the pricing for menus. He knows, for instance, how lamb sold this year as opposed to last year; whether lamb did better paired with squash or with risotto; and whether orders decreased when the price of the main course was hiked from $39 to $41. So let's run through the Economist's sleight of hand in slow motion. 1. Internet-only subscription for $59. 2. Print-only subscription for $125. 3. Print-and-Internet subscription for $125.